With every bite of this Walnut Pesto Salmon with Hemp Seeds, you are getting a rich variety of omega 3’s and heart healthy fats. 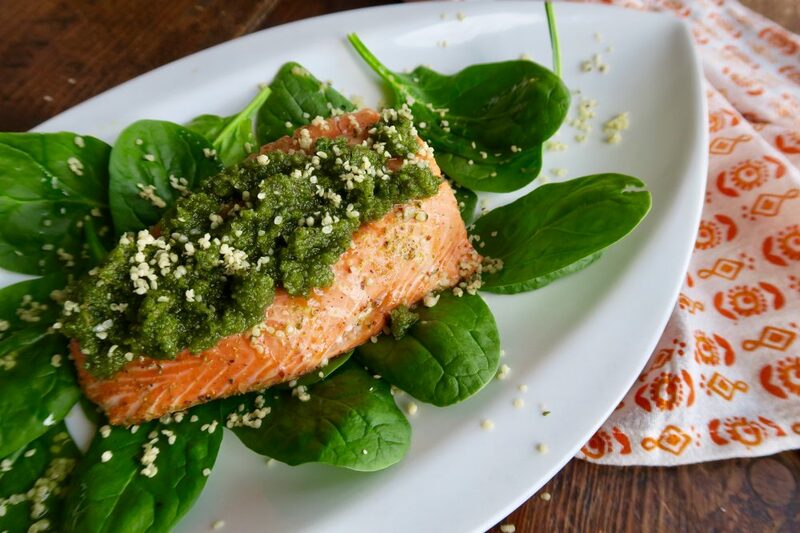 Salmon, olive oil, walnuts, and hemp seeds are all loaded with unsaturated omega-3 fatty acids, aka “the good fats”. Omega-3 fatty acids are a type of unsaturated fatty acid that may reduce inflammation throughout the body. 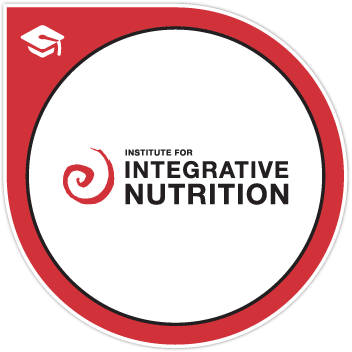 Inflammation in the body can damage your blood vessels and lead to heart disease and strokes. Scientists also believe these fats help lower your overall cholesterol. A diet rich in omega-3 fatty foods is very popular in the Mediterranean diet. Basil is also part of this heart healthy mix. Basil brings an array of vitamins and antioxidants to the dish. I try to encourage my clients to buy wild caught salmon. Wild caught salmon are happier, healthier, free-roaming fish and deliver a more salmon-y flavor and color. Their flavor will be more savory and complex. Their texture will be leaner and flakier. This dish is not only super heart healthy, but it’s also really easy and quick to put together and its wonderfully delicious. A definite crowd pleaser! Preheat oven to 350 degrees. Line a baking sheet with parchment paper. Place salmon on prepared pan. Drizzle salmon with 1 teaspoon of olive oil. 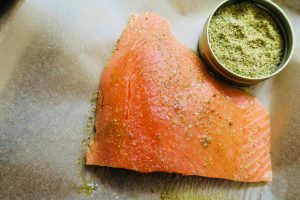 Sprinkle salmon with seasoning, fennel pollen and salt. Bake for approx. 9-11 minutes or until fish easily flakes with a fork. While fish is baking, make pesto. In a food processor, grind walnuts into smaller pieces first. Then add basil, parmesan, garlic, salt, and pepper. 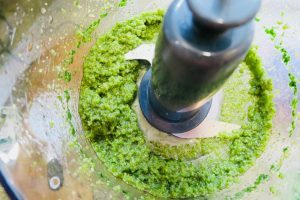 Grind into a paste consistency. Then drizzle 2T olive oil into processor until mixed well. Divide spinach onto 2 plates. Place salmon on top of spinach. Top with pesto. Drizzle with remaining olive oil. Sprinkle both pieces with hemp seeds to finish.